With the help of parameters, you can run the same project for different source files or time periods, parametrize expressions, and perform "what-if" analysis. Project parameters can be used in action properties, in expressions, and in database queries. Parameters are also used to arrange iterations (described in next chapter). In actions, parameters can be used to define values of some properties. Typically, such action properties as file names, folder paths, numeric constants or dates can be defined with a project parameter. If a action property can be defined using a parameter, it has a black arrow next to it (see screenshot below). In expressions, parameters serve as constants. Parameter names in expressions should be wrapped in curly brackets. 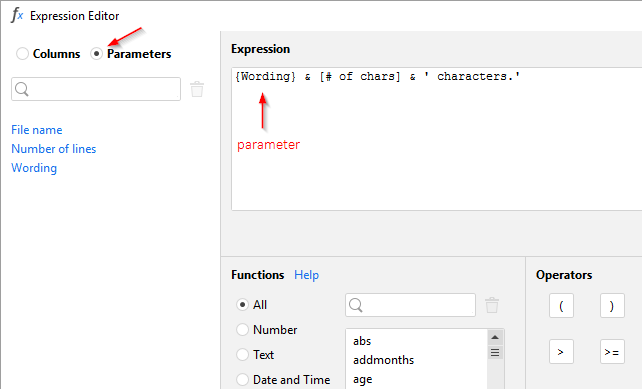 For convenience, the Expression Editor has a clickable list of parameters. Project parameters can be used in visual database queries. Click the black arrow to replace a condition value with a parameter (see screenshot below). Project parameters can be inserted into a custom SQL query or WHERE clause. Before executing the query, every parameter name in curly braces is replaced with its current value. Put quotes around curly braces when a text value is expected to be inserted into the query. Before a parameter can be used it must be declared (created) first. 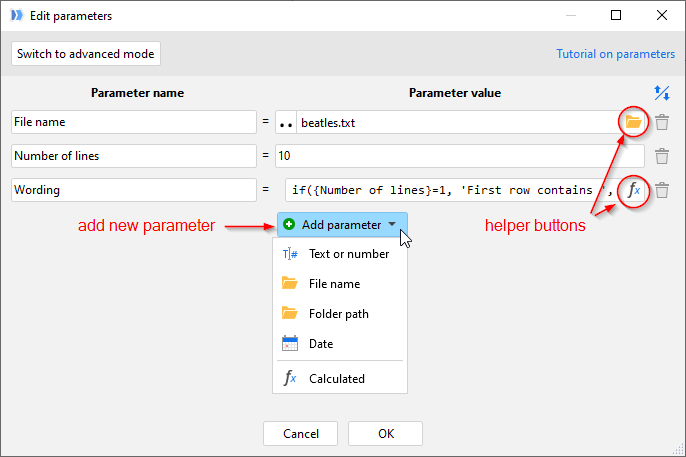 Creating, editing, renaming and deleting parameters is done with the help of Parameter Editor. To open Parameter Editor, press "Edit parameters" in menu Project, or press F6. There are two types of parameters: input parameters, and calculated parameters. Input parameters are entered by a user. For convenience, input fields for parameters that are file name or date can have a helper button that invokes the file browser dialog, or a calendar. A calculated parameter is a parameter that is calculated using an expression that can contain arithmetical operators, functions and references to other parameters. References to field names make no sense in such expressions and therefore are not allowed. Hint: A calculated parameter can refer to other calculated parameters. Project parameters are global and immutable, i.e. they are available to all actions in a project and do not change during project execution. When Auto-run mode is on, changing a parameter value automatically triggers re-calculation of all actions that use the parameter to define a action property, in an expression, or in a database query. First, this ensures consistency of calculations and makes sure that all action results are calculated using the same parameter values. Second, it is convenient for "what-if" scenarios — by changing parameters you can automatically re-run calculations and evaluate various outcomes.